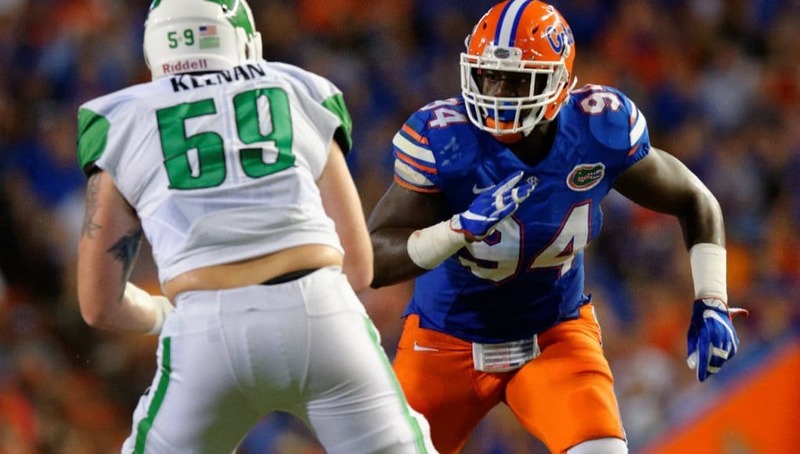 Florida Gators senior spotlight: Defensive end Bryan Cox Jr.
Bryan Cox Jr. came to Florida out of St. Thomas Aquinas High School as the No. 66 player in the state of Florida and a three-star prospect by Rivals.com. The defensive end chose Florida over Louisville, Miami, and Michigan State. When Cox arrived at Florida, he wasn’t quite ready to see action on the field yet. He redshirted his first season and used that time to get bigger and stronger. Cox was 235-pounds when he arrived on campus and was listed at 260 for his redshirt freshman season. As a redshirt freshman, Cox found himself in the defensive line rotation at times. He had five tackles on the season. He got his first career sack at Kentucky in 2013 and went on to have another in the final game of the season against Florida State. 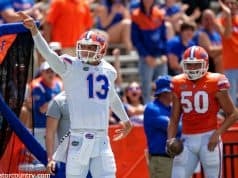 Cox gained a regular starting position as a redshirt sophomore, as he started in 10 games at defensive end for the Gators. He had 29 total tackles, six tackles-for-loss, and four sacks in the 2014 season. Three of his four sacks came in an outstanding performance in Florida’s 10-9 win at Tennessee. The best game of his young career came just after finding out the news that his grandfather had passed away. He spent the days prior the game in Atlanta with his family and didn’t arrive in Knoxville until late on the night before the game. Cox honored his grandfather well that day and has continued to do so throughout his career at Florida. He really began to come into his own his redshirt junior year. Cox recorded 45 tackles in 2015, with his best game coming against Vanderbilt as he put up eight tackles. He had 10.5 tackles-for-loss, six quarterback hurries, and two forced fumbles on the year. Cox returned for his redshirt senior season with one thing in mind, and that was to help his team get back to Atlanta. Injuries have kept Cox from having the season that he personally would have liked to have so far, as he has been limited in several games. He has 16 total tackles, two tackles-for-loss, and is only behind Jabari Zuniga with six quarterback hurries this season. He had another career day against Tennessee this season when he picked up nine tackles in the game. Though he has dealt with a number of injuries this season, he has been a huge part of what makes Florida’s defensive line one of the best in the country each and every year. 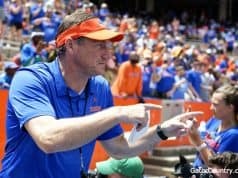 Cox will say goodbye to The Swamp this Saturday after spending the past five years with the Gators.